Hello! I'm sharing this card here and on the Sweet 'n Sassy blog a monochromatic card I made with the stamp set The Sea. To make it a bit more dramatic, I made an alteration of the telescoping technique. 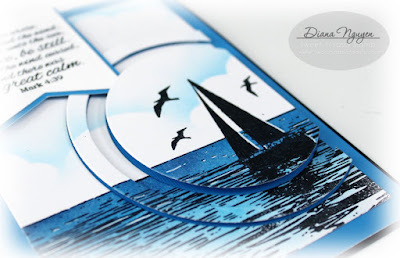 After sponging the sea and sky and stamping the image, I die cut three concentric circles with the smallest centering on the boat. I then popped up the outermost ring with one layer of foam tape, kept the middle ring flat, and then popped up the center with two layers of foam tape. I liked how you still get a dramatic effect yet the card is not too thick. I then added the banner with the Scripture from Mark and touches of white with a gel pen. I just love this set! So great for masculine cards! wow.. this card is so gorgeous.. I love your telescoping technique 2!! Wonderful card and colors that really pop without being garish. Super use of the telescope technique......thanks for your assembly hints. They are always an inspiration. A fabulous card, a super design with a wonderful colour combo.......your image is stunning and gorgeous sentiment panel!! hello Diana! wow, what an amazing serene scene, this is gorgeous! 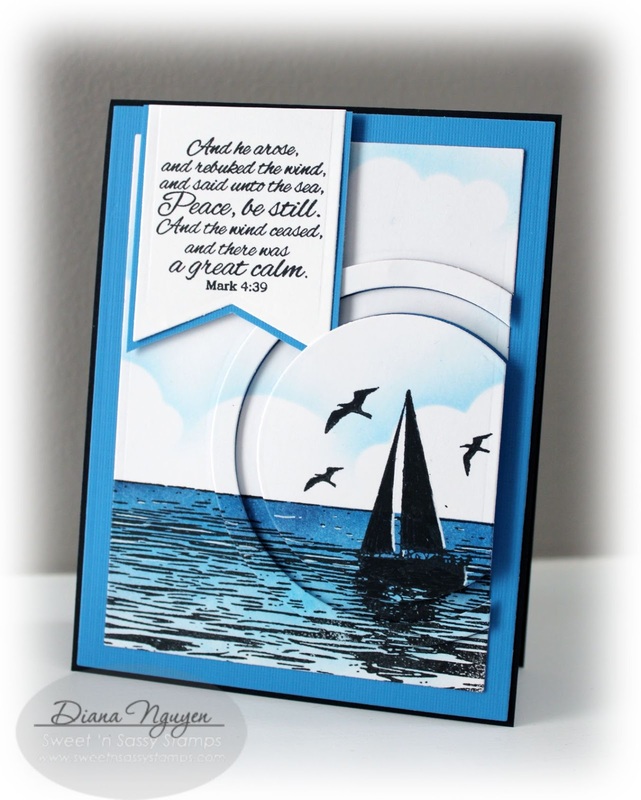 so glad you played along with us at Simon Says Stamp Wednesday Challenge! Stunning card Diana! I LOVE it! Great layering too! Thank you for playing along in the Word Art Wednesday Challenge! Have a blessed day! wow---such a stunning card! Thank you for joining us over on the HIMCR blog this week! Beautiful! Love that technique! Thanks for joining us this week at HIMCR!